The latest story opens on Bifrost, the magical rainbow bridge that leads from Earth to the heavenly home of Asgard, as its guardian Heimdall is approached by Neri, one of the hand-maidens of Fricka, Queen of Asgard. The character of Neri was entirely made up - but, debatable etymology aside, Fricka certainly wasn't. Which brings up a question I've had since the first Loki story: Who was responsible for bringing the Norse mythical elements into the stories in the first place? Normally we could simply respond "the writer", but as all the Thor stories have thus far been written by two separate men - Stan Lee doing the plots, with someone else (Larry Leiber, then Robert Bernstein) providing the dialogue - it's a thornier issue. For instance, anyone who's seen a reproduction of one of Stan Lee's plots knows that they were generally little more than broad strokes. And here the inclusion of Fricka isn't relevant to the plot at all, as the woman who meets Heimdall at the bridge could have been any Asgardian. On the other hand, the increasing number of mythological elements - the introduction of Heimdall and Bifrost in the first place, for instance - did have to arise at the plotting stage, as opposed to being just a bit of flavor text thrown into the dialogue after the pages were already drawn. This may not add overly much to the ongoing question of how much was done at one stage over another, from plotting to pencils to dialogue, but we can at least see that even an attempt to wholly credit just one step for the inclusion of the mythological source material isn't nearly as simple as we might expect. Although the plot idea of "Loki steals Thor's hammer!" is a basic one, it's impressive to see that the 13 pages are used with an economy rarely seen today. 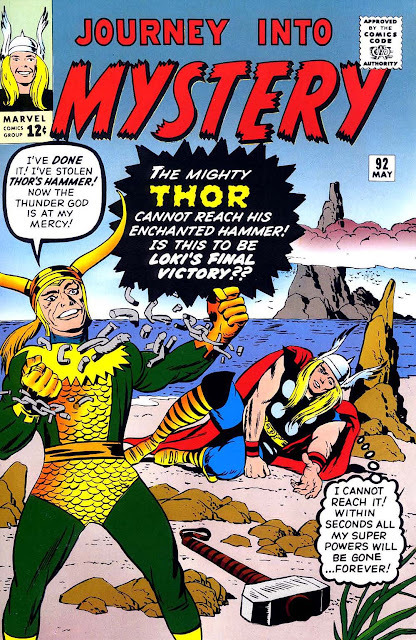 After the Bifrost prologue which sets up the fettered threat of Loki, Thor first takes a couple of pages to capture some jewel thieves who had the misfortune to corner him in Don Blake's medical practice, before then fighting a mechanical serpent in and under the sea for a filmmaker's Viking movie. (And we don't even have a full panel in which to roll our eyes at Thor taking part in such a trivial task before he mentions that his proceeds are all going to charity.) Add in Loki using his trickery to break free, Thor calling on Odin for aid and advice, and a creative showdown between Thor and Loki's machinations, and we end up with a comic that should have been a dull execution of a very simple idea - as with many of the Ant-Man tales, for instance - but is instead far more entertaining than we expect. 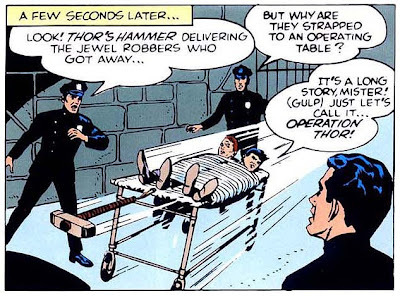 While not quite up to the level of other Goofy Silver Age Writing of the era, the way that Thor gets by without his hammer in the latter half of the story does raise certain questions of logic. When Thor enters the Asgardian forest to search for his mystical mallet, Loki magicks the trees into attacking him. In response, Thor chops one down with the edge of his hand, does it again with a smaller tree, and binds the two with vines to create a makeshift hammer with which to fight the animated brutes. Later, when Loki transforms lazy clouds into angry, fearsome dragons, Thor rushes to the nearby mountainside and inventively uses his fingers at lightning-fast speed to chisel yet another mallet from the stone of the cliff. And maybe the ten-year-olds this was aimed at wouldn't question it. Looking at it ourselves, however, we can't help but wonder: If Thor's hands are that powerful ... then why does he need a hammer in the first place? 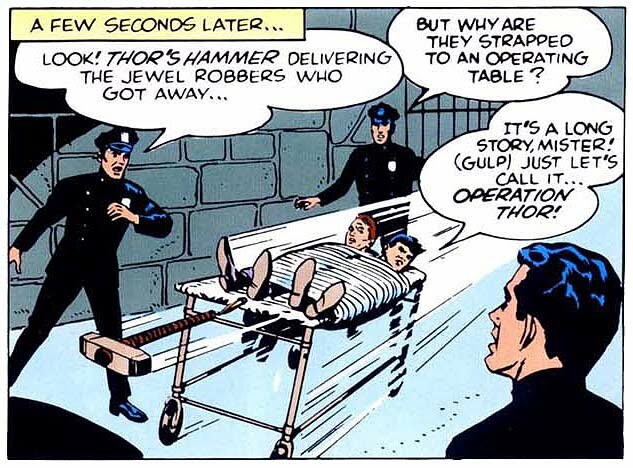 In one of Thor's nuttier moves: Bad guy delivery service!